Goldstrike Mine, North Eastern Nevada. Map and News. Elearning. 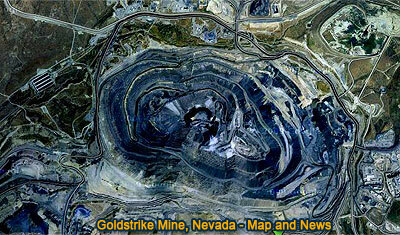 Explore the geometry of Goldstrike Mine, North Eastern Nevada through detailed Google satellite imagery. To Pan: click and drag the map. Take advantage of the zoom bars. Barrick Goldstrike is a gold mine in North Eastern Nevada, Lynn District, Eureka County. The Goldstrike consist of three distinct mines. The large open-pit mine Betze-Post and the two Underground mines Meikle and Rodeo. Read More. See also: Goldstrike Mine, Open Pit Art.